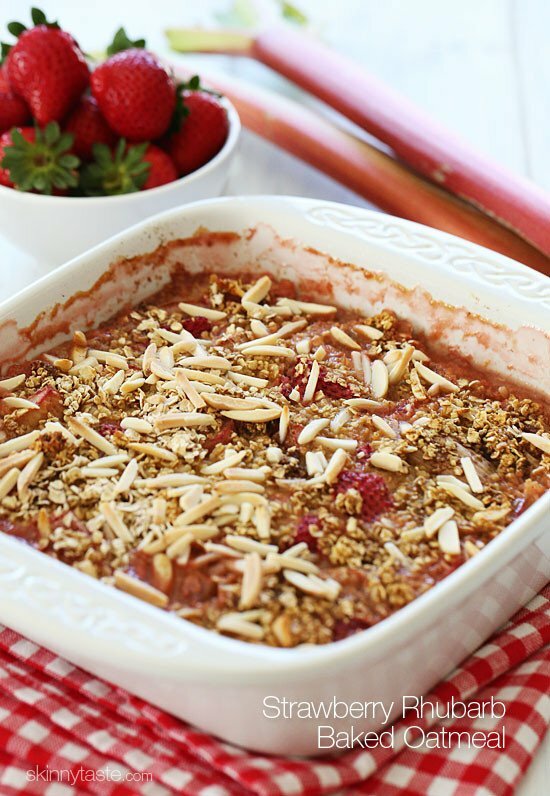 Strawberries and rhubarb baked with bananas, oatmeal and slivered almonds – this is so good you’ll almost think you are having dessert for breakfast! It’s rhubarb season and I’ve always loved the combination of strawberries and rhubarb in pies and crumbles. One of my favorite baked oatmeal recipes that I LOVE to bring to potlucks or serve for brunch is Baked Oatmeal with Bananas and Blueberries, so after my friend Raquel asked me how strawberry rhubarb would taste, I immediately started experimenting. I loved the combination, especially when I added the ripe bananas, I felt they added an extra sweetness to the tart rhubarb without having to add more honey. I think this would be wonderful for a Mother’s Day brunch; six servings is very generous, especially if you have other options on the table. Lightly spray a 9 x 9″ ceramic baking dish with cooking spray; place banana slices on the bottom of the baking dish and set aside. In a medium bowl, combine the oats, half of almonds, baking powder, cinnamon, and salt; stir together. In a separate bowl, whisk together the remaining honey, milk, egg, and vanilla extract, then add to the oats. Pour the oat mixture over the strawberries and rhubarb, making sure to distribute the mixture evenly. Sprinkle the remaining almonds over the the top. I dislike bananas, so I made this with extra strawberries and rhubarb instead. It was delicious, but it’s not a baked oatmeal. It’s a crisp. I liked it better than the Skinnytaste Strawberry Rhubarb Crisp recipe. I would make this again as a dessert and use a little less honey in the filling. has anyone prepared this the night before and then cooked it in the morning? I adore rhubarb so I had to make this! I agree with the other posts, this is dessert, not breakfast. Love that there wasn't any sugar in it. I used half honey half maple syrup. Omitted bananas and tripled the rhubarb since I'm a little (lot) obsessed with it. 🙂 I'm going to use the filling in a pie next time and omit the oatmeal/nut layer. Filling was awesome! Going to my Brother-in-laws today. I'll see if his Rhubarb is growing yet. Can I freeze this in individual portions? 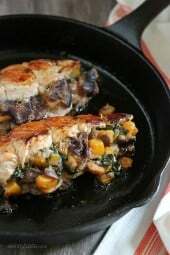 I was wondering if there is a substitute for the rhubarb in this recipe? Anon, I couldn't find rhubarb at my Safeway either (seems like whenever I actually want it they don't have it, and whenever I don't need it I see it there). I'm trying this recipe with 2 bananas instead of 1 in place of the rhubarb. I'm assembling the wet and dry ingredients tonight and will bake it tomorrow morning. I'll let you know how it goes :-). I can't see how strawberry-banana oatmeal could turn out poorly! I'm expecting delicious results. Should left overs be refrigerated or are they ok on the counter covered, like a pie or cake? What do you suggest as a substitute for the egg? Made this today for breakfast. It was good but a little too sweet for breakfast. It tasted more like a cobbler to me. It would be perfect for dessert. I finally found rhubarb. Now I just have to wait for my bananas to ripen up. Could I use steel cut oats to add more fiber with this recipe? Made this on Sunday and have now had it for breakfast the past three days. I used half regular honey and half orange infused honey and instead of of almonds I used pecans (what I had on hand). Another incredible recipe Gina and I think my new favorite breakfast!! I made this & shared with two friends. We all LOVE it & it just makes my mouth water thinking about it. Keep the fantastic recipes coming Gina & thank you!! i dont know rhubarb , what should i use instead of it? This was so yummy! I added about a tablespoon of low sugar strawberry jam to the fruit mixture. It really gave the strawberry flavor a punch! This looks amazing! Would it freeze well? I cook mainly for 1 so would love to be able to have a few portions over the week and then enjoy the rest later. I made this for Mother's Day and everyone loved it, they couldn't tell it was a "skinny" recipe, lol. A girl I work with has lots of fresh rhubarb in her garden and shares it with all us so I'm printing off several copies of this recipe to pass out to my co-workers. Had this for breakfast today. I absolutely love it. Want to sneak into the kitchen for a second serving. Made this last night with the rhubarb that came in my first CSA box of the season with the intention of eating it the rest of the week. Reheated this AM. Very tasty and bet it is even better right out of the oven! Had with a little ff vanilla yogurt. Great combo! I made this yesterday. My almost 3 year old said "I love this momma!" The only other thing he tells me he loves is me..lol! Aww you made my day! I just made this today, and wow… Amazing! I love baked oatmeal recipes, but this one is by far my favorite. Thanks for the recipe! 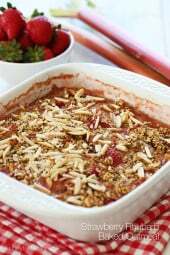 Can this be made using frozen strawberries and regular (not quick-cooking) oats? I actually made it with regular oats. I cooked it a little longer, using the directions from a different recipe I've made in the past. Keep the temperature the same, cover with foil and bake for 30 minutes, then take the foil off for another 15 minutes. Came out perfectly! I just made this tonight and it was a big hit for our dessert (my partner ate seconds and said he didn't care how many points it was haha). Thanks Gina. I did substitute agave for the honey and cut back on the nuts to shave it to 5 points per serving (weigh-in day tomorrow). I think in the future I will leave out the bananas and add more rhubarb — I couldn't really taste it (though I've never eaten it before, so don't know what it tastes like). You keep coming up with winners! This looks amazing! I thought I was all done with rhubarb baking for the year but now I have to try this! 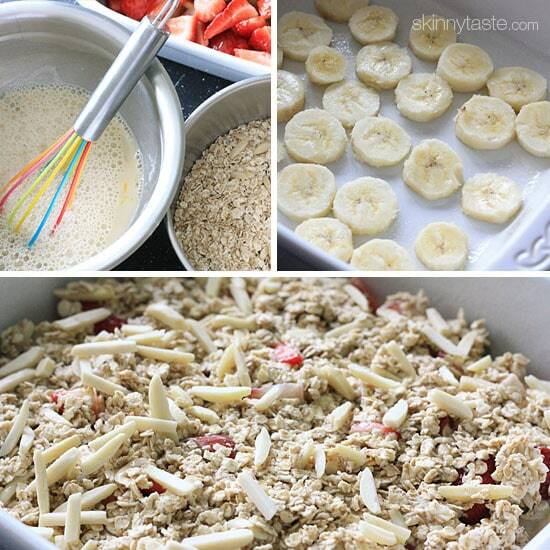 I have to try this…I have made your Strawberry-Banana Baked Oatmeal and is so delicious. Thanks for all your wonderful recipes. All I have on hand is old fashioned oats… can I use those instead of the quick cook oats? Oh my goodness…as soon as I get my hands on some rhubarb this is happening! What an amazing idea! My rhubarb just started coming up. How soon can you start to use it? I've been looking to try baking with rhubarb and this looks like the perfect recipe to try out first! I am so badly craving rhubarb and this oatmeal looks like just the treat to satisfy my craving! Prepared this ahead of time, put in the fridge for the night. Baked it in the morning as recipe said and it turned out wonderful! G'day! Love the combination of rhubarb and strawberries, TRUE! Baked oatmeal is a bonus on a busy morning too! If you can't find fresh rhubarb, could you use frozen? I never ate rhubarb growing up, even though it was pink (my favorite color as a kid!). I first tried it on a volunteer trip to Alaska when one of the locals made a rhubarb cobbler, and I've been meaning to try making a rhubarb dish of my own ever since. That was almost 4 years ago… Your baked oatmeal looks so sweet and healthy; I'm sure it'd be a great first starting point for me! This sounds wonderful, perhaps minus the banana? I'm not a fan of ripe bananas, and they seem to dominate everything they are in. I so agree. Plus bananas are high in carbs and sugar. Can I make this the night before and store in the fridge and then stick it in the oven in the morning? Or would it get too soggy? I would fully cook it the night before, then heat it up. Does this reheat well? It sounds amazing! This recipe makes me wish my rhubarb was ready for picking! Hopefully in another week or so it will be ready and I can make this. I have always loved strawberries and rhubarb, but interested in trying it with banana. Growing up, we always had strawberry/rhubarb jam, pie and cobbler. Yum! I love it too, especially in a cobbler! More rhubarb recipes please! Can't wait to try this one! What perfect timing!! We just picked up rhubarb and strawberries and were about to search for a lower fat healthy alternative to pie!! Thank you so much for this post! This is not exactly recipe related, but I love your whisk!! It is so colorful and fun!! lol gina! you are killing me!!! i went to the bulk store 3 nights ago and got a ton of strawberries..then forgot the rhubarb at the farmers market. and then yesterday and today forgot to stop for it for errands! I'll have to grab some rhubarb at the store today! 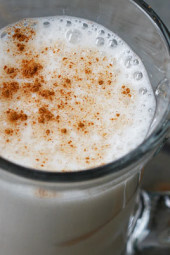 you say any milk – can it be almond/coconut milk? Or does it need to be an actual milk? Almond, soy, etc works fine too. I used almond milk in the banana blueberry baked oatmeal and it was very tasty. Used egg substitute, too and the texture was fine. My husband loved eating dessert for breakfast! 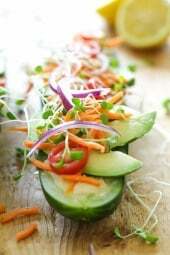 You might try sunflower seeds or pumpkin seeds. I agree, these nut seeds are better for you. 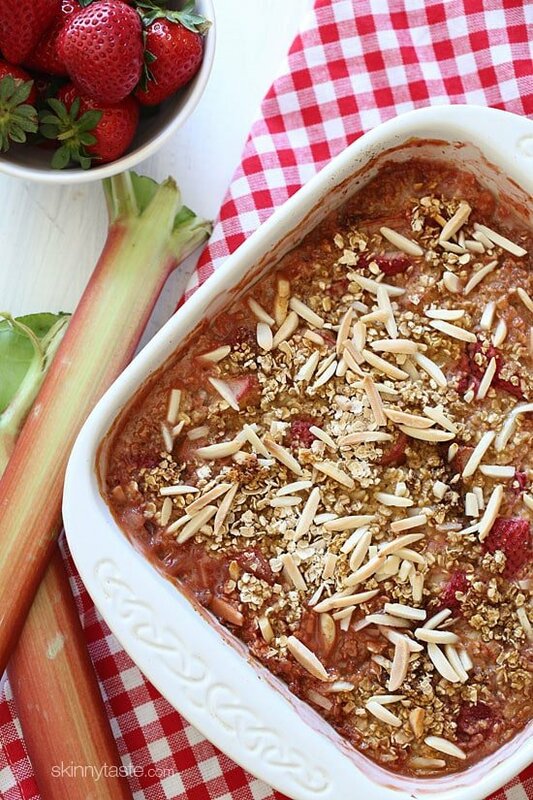 I've never really known what rhubarb is, but I love all foms of baked oatmeal, so simply must give this a try! lovely! I think I will try this just about to do some oat recipes on my blog. Love your cute whisk too! I have a deep love for rhubarb! Will be trying this very soon. Thanks for the recipe! is it possible to make this without the honey? Yes, you can use any sweetener including stevia.